Say goodbye to 2018 and hello to 2019 - what questions still linger about AI, and what are the latest trends? 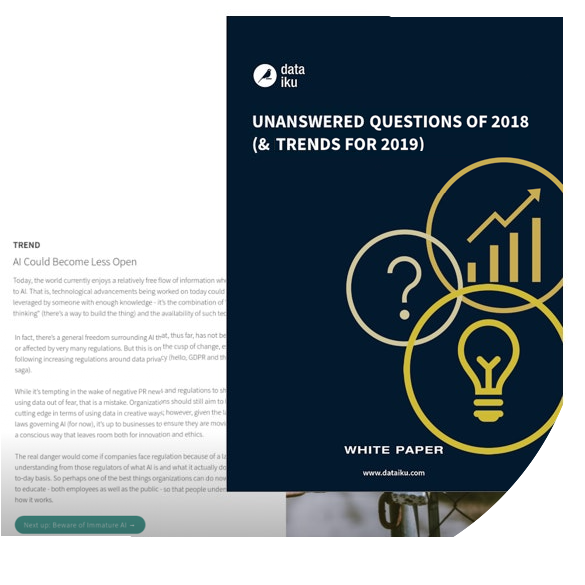 This white paper has answers. We’re now pretty much officially in 2019, and this year was supposed to be the one where all kinds of companies made revolutionary strides in the area of artificial intelligence (AI). Turns out AI is much easier talked about than executed, and there are still a fair number of open questions that need to be answered. Meanwhile, new trends in AI are rising, and companies that aren't paying attention might be left behind before they even get started. The top 5 lingering questions (+ suggested solutions) on data teams' and business owners' minds, including: What kind of data scientist should I be hiring? Why is everyone talking about collaboration in terms of data science? And more! An early look at the top 5 up-and-coming trends for 2019, including a deeper dive into AutoML (or AI for AI) as well as "Immature AI."